The head of the National Domestic Workers Alliance discusses disappointments dealt by Democratic politicians, the challenges of sustaining non-union labor groups and how to confront the coming care crisis. The past decade has seen a surge of organizing by domestic workers in the United States. These workers, who care for children, senior citizens and disabled people in their homes, are explicitly excluded from many of the basic protections of federal labor law, including union organizing rights. Their job is characterized by low wages, long hours and meager benefits, and it’s among the fastest growing in the US economy. 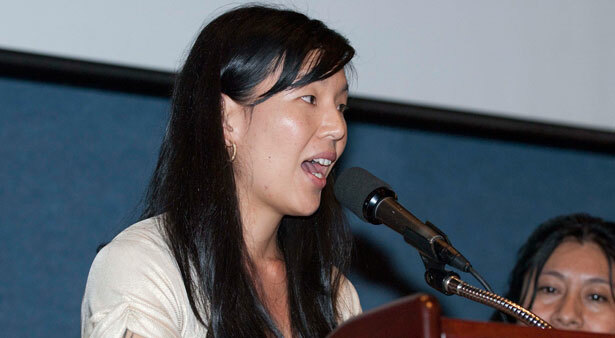 Last Friday, The Nation sat down with Ai-jen Poo, a founder of New York’s Domestic Workers United, who now directs the National Domestic Workers Alliance. We discussed some disappointments dealt by Democratic politicians, the challenges of sustaining non-union labor groups and how to confront the coming care crisis. What follows is a condensed and edited version of our conversation. The Nation: What’s happening to work in the United States? Does labor have the tools to grapple with it? Ai-jen Poo: Our tools are not sufficient. What is happening is that work is becoming more unstable, insecure, dangerous and vulnerable. When I first started organizing domestic workers, people kind of perceived it as this very exotic shadow workforce at the margins of the economy. But when you look around these days, the conditions that define domestic work are not so different from the conditions that define every American worker’s realities. As more and more people become temporary, part-time or contracted, nobody knows who their real boss is, no one has collective bargaining, no one even knows what bargaining is and no one works in a workplace where bargaining is actually feasible. We’re essentially all becoming domestic workers. The work that we and others are doing to try to create power and voice in that context has some of the seeds of what we need in the future, but I don’t think we’ve quite gotten to a model where we have adequate tools when we really come up against power. When we really go up against [restaurant giant] Darden or Walmart, what we have is simply insufficient. I think it will take a combination of these models getting to sufficient sophistication and scale, and a very broad-based movement of people who are invested in the future of work, and can connect to it on a deeply personal and emotional level and want to take action. To me, there are three core questions. First is narrative. The second is policy. And then the third is around organizational models, because as awesome as I think our affiliates [local labor groups for domestic workers without union recognition] are, we not self-sustaining, self-financing organizations. We count on foundation money and donors. And so how we actually get to scale and build self-financing workers’ organizations in the twenty-first century is a huge unanswered question. Domestic Workers United is exploring setting up a dues structure. What does that look like? It’s a voluntary dues structure, so it’s like we’ll get a few thousand dollars, and then people will drop off, and it will be hard to track people down. As long as it’s a voluntary dues structure it’s going to be very tricky. Does solving that problem require winning collective bargaining rights? Yes, that’s where the policy comes in. But dues is not the only way. The Freelancers Union has set up a very successful health insurance company. We’re not going to set up a health insurance company, but we’re trying to figure out how we can do something that meets the needs of this very large and growing workforce, that would encourage people to pay into dues on a regular basis and/or could be profitable—new revenue sources besides dues. For example, we are looking at trying to start an online social enterprise where we match trained care workers with consumers who need care online. And we could potentially move to provide wrap-around services for high-road employers who want to provide health insurance, as well as help workers set up bank accounts so we could do auto dues deduction and things like that. Like a union hiring hall for domestic workers? Yes. So we’re exploring that and ideas like it. Also, I think frankly comprehensive immigration reform is the biggest organizing opportunity of our generation. And if we can figure out how to position unions and workers’ centers as the brokers of the new citizenship, that’s a huge way that we can both organize millions of low-wage workers and strengthen the movement for the long term. So we’re building up capacity of our members, training them to use this moment as an organizing moment, but also figuring out the ones that do have the capacity to provide services to help people process whatever provisional legal status [is provided under immigration reform], and do whatever’s involved with the path to citizenship, which I think will be fairly complex. Do you worry that matching workers with jobs has downsides in terms of their relationship to the organization? When I was an organizer and we had a banquet hiring hall, some members started to look at the union like a temp agency, or like their boss. The only way to deal with that is good organizing. You have to make sure that the primary apparatus in your institution is an organizing apparatus, and everything flows from there. And it’s tricky to maintain that balance, because to run a successful hiring hall is a project in itself. So we’re actually going to separate out the social enterprise from the organization, and have the enterprise feed the organization and the other way around, but develop a little bit of a firewall. I imagine it will be a huge challenge. But any organization that has any level of scale has to either provide a really meaningful service to their membership that deals with meeting their daily life needs, or provide some kind of spiritual enlightenment. Maybe the labor movement will one day do that, but I don’t know. It’s going to be complex, and as long as we keep our eyes on the organizing prize, hopefully we can mitigate against the worst pitfalls of that. One of your biggest victories was the passage of a Domestic Workers Bill of Rights expanding labor protections in New York State. Some DWU members say the law’s impact has had limits: employers have found loopholes. Some employers don’t know about the law. Some workers don’t know about it. How do you respond to that law’s skeptics? The laws are just a tool for workers to be able to organize and improve their working conditions. And it’s such a disaggregated workforce that even if you have really great organizing in one corner of the city, in another corner people have no idea. And so we just have to keep organizing. That’s really the only way that the bill gets enforced, and certainly the only way that standards get raised beyond what’s in the bill. So it’s an organizing challenge, and a tool. I think we’re much better off with it than without it. We used to just organize around minimum wage violations, and now we have much more to organize around. California’s version of the bill was vetoed by Governor Jerry Brown last year. Since then, Democrats won veto-proof majorities in the state legislature. Rather than negotiating a compromise with Brown, why not just push the Democrats to pass the same bill and override a veto? I think that’s a good back-up plan, but ideally we wouldn’t have another veto. Even though there’s a super-majority, it’s a lot of freshman members, and we’re sort of having to start from scratch in a lot of places. And if the governor signals that he wants to do it, it will be much easier to get a supermajority [behind the bill]. So ideally we would win him over, which would be important for enforcement anyway. And then there are all of these other states. Massachusetts and Illinois, where worker affiliates feel very optimistic about the possibilities of passing legislation. And legislators in Oregon and Hawaii also introduced domestic worker bills. At the federal level, could we see fracturing within organized labor if politicians move towards a compromise that offers a path to citizenship at the cost of labor protections for guest workers? Labor seems pretty aligned right now and solid, so I hope not [Poo “knocks on wood” on the table]. You never know. But as far as I can tell, all of the unions seem to be communicating and working together on this, and even working with us on it, so so far, it’s OK. I think everything’s going to change once there’s a bill. That’s when it’s going to get really interesting. Immigration reform, it’s just a huge opportunity to potentially win legal status for millions of workers, including care workers and domestic workers. So we’ve been really all in, trying to push to make sure that happens, and to make sure that the path to citizenship is as inclusive as possible. Things like making sure there’s no requirement of proof of continuous work history, because that would be difficult for both moms and domestic workers, not to mention lots of other informal sector workers. And we’re trying to shape what the future [immigration] flow programs look like. To make sure that if there are care worker immigration programs in the future, people can bring their families, have portability of status [between employers], as well as full worker rights and protections. Our main strategy has been actually to contextualize the domestic worker piece in the context of a women’s agenda for immigration reform. [Meanwhile,] we’re trying to knit together the interests of immigrants and the aged and people with disabilities, so that those interests don’t get pitted against each other. Similarly, last year we reached about half a million moderate-to-conservative seniors in five swing states and talked to them about Medicaid and Medicare, but mostly wanted to talk to them about what it would look like to be in alliance with a rising electorate of color. And we’re framing what we’re doing as building the “caring majority alliance,” which actually knits together the interests of a rising electorate of color with the interests of a rising older white electorate. With the age wave, and the boomer generation, and people living longer, we are potentially going to be very racially and generationally polarized in this country. So we’re trying to say that white seniors and younger people of color actually have a shared destiny, and very clear material self-interest in working together. And shared interests. Many expected the Department of Labor to approve new proposed federal regulatory protections for domestic workers before the election, but that didn’t happen. Now that DOL has done so, and the potential changes are under consideration by the Office of Management and Budget, how do you see where that process stands? The ninety days for it to be finalized is up in mid-April. But yeah, I don’t know. Anything could happen at any point, and the regulatory process is sort of opaque. All we can do is continue to elevate the significance, and the impact in people’s lives, of not having this regulatory change. So that’s something we’re focused on. I’m hoping it does get finalized in a couple weeks. If we win, it will be one of the most significant victories for low-wage workers of the Obama administration. But what’s at stake is the message it sends if we don’t. What should we conclude from a Democratic administration’s slow movement on these rules, and a Democratic governor vetoing a Domestic Worker Bill of Rights? We have a history of undervaluing care work, and not accounting for it. So we have that culture that’s within our economy, and now we’re also living in this really intense austerity environment, so anything that needs public funding makes people very nervous. It’s also partly that the industry lobby is strong, they have a voice, and they simply don’t want to pay overtime. Is there a shift you want to see from the Obama administration? There has to be a shift on every level. Because we are headed for a major crisis from not recognizing and accounting for care. If it’s a problem now, twenty years from now, when we have the largest older adult population we’ve ever had in the history of the country, it’s going to be a crisis of epic proportions. If we think workers and families are getting squeezed now, it’s only going to get worse if we don’t think and act really quickly to ensure that there are basic protections on both sides. And so I think it’s an emergency situation. I think it’s a crime, and it’s scary, that the fastest-growing workforce in the country is excluded from minimum-wage protections. I think that says a lot about our economy. And if we want to say something different about our economy, I think it begins with this workforce. A former Walmart manager accuses the company of widespread inventory manipulation—and discrimination. Read Spencer Woodman’s take.